(Nanowerk News) Conventional wisdom holds that optical microscopy can't be used to "see" something as small as an individual molecule. But science has once again overturned conventional wisdom. Secretary of Energy, Nobel laureate and former director of the Lawrence Berkeley National Laboratory (Berkeley Lab) Steven Chu led the development of a technique that enables the use of optical microscopy to image objects or the distance between them with resolutions as small as 0.5 nanometers – one-half of one billionth of a meter, or an order of magnitude smaller than the previous best. "The ability to get sub-nanometer resolution in biologically relevant aqueous environments has the potential to revolutionize biology, particularly structural biology," says Secretary Chu. "One of the motivations for this work, for example, was to measure distances between proteins that form multi-domain, highly complex structures, such as the protein assembly that forms the human RNA polymerase II system, which initiates DNA transcription." 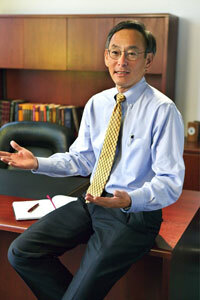 Secretary Chu is the co-author of a paper now appearing in the journal Nature that describes this research. The paper is titled "Subnanometre single-molecule localization, registration and distance measurements." The other authors are Alexandros Pertsinidis, a post-doctoral researcher and member of Chu's research group at the University of California (UC) Berkeley, who is now an assistant professor at the Sloan-Kettering Institute, and Yunxiang Zhang, a member of Chu's research group at Stanford University. Steven Chu, Secretary of Energy, Nobel laureate and former Berkeley Lab director, is still making time for science as evident by a recent Nature paper describing a revolutionary super-resolution optical microscopy technique whose development he led. According to a law of physics known as the "diffraction limit," the smallest image that an optical system can resolve is about half the wavelength of the light used to produce that image. For conventional optics, this corresponds to about 200 nanometers. By comparison, a DNA molecule measures about 2.5 nanometers in width. While non-optical imaging systems, such as electron microscopes, can resolve objects well into the subnanometer scale, these systems operate under conditions not ideal for the study of biological samples. Detecting individual fluorescent labels attached to biological molecules of interest using charge-coupled devices (CCDs) – arrays of silicon chips that convert incoming light into an electrical charge, has yielded resolutions as fine as five nanometers. However, until now this technology has been unable to image single molecules or distances between a pair of molecules much less than 20 nanometers. Chu and his co-authors were able to use the same CCD-fluorescence technology to resolve distances with subnanometer precision and accuracy by correcting a trick of the light. The electrical charges in a CCD array are created when photons strike the silicon and dislodge electrons, with the strength of the charge being proportional to the intensity of the incident photons. However, depending upon precisely where a photon hits the surface of a silicon chip, there can be a slight difference in how the photon is absorbed and whether it generates a measurable charge. This non-uniformity in the response of the CCD silicon array to incoming photons, which is probably an artifact of the chip manufacturing process, results in a blurring of pixels that makes it difficult to resolve two points that are within a few nanometers of one another. Graph on left shows that with the active feedback system off there is a resolution drift of about 0.3 pixels or 19 nanometers, whereas with the feedback system on resolution is maintained at better than 0.01 pixels, or about 0.64 nanometers. Image on right shows individual Cyanine (Cy) fluorescent dye molecules – Cy3 and Cy5 - used to label 20 base pairs of double-stranded DNA. "We have developed an active feedback system that allows us to place the image of a single fluorescent molecule anywhere on the CCD array with sub-pixel precision, which in turn enables us to work in a region smaller than the typical three pixel length-scale of the CCD non-uniformity," says Pertsinidis, who is the lead author on the Nature paper. "With this feedback system plus the use of additional optical beams to stabilize the microscope system, we can create a calibrated region on the silicon array where the error due to non-uniformity is reduced to 0.5 nanometers. By placing the molecules we want to measure in the center of this region we can obtain subnanometer resolution using a conventional optical microscope that you can find in any biology lab." Chu says that the ability to move the stage of a microscope small distances and calculate the geometric center (centroid) of the image makes it possible to not only measure the photo-response non-uniformity between pixels, but also to measure the non-uniformity within each individual pixel. "Knowing this non-uniformity then allows us to make corrections between the apparent position and the real position of the image's centroid," says Chu. "Since this non-uniform response is built into the CCD array and does not change from day to day, our active feedback system allows us to image repeatedly at the same position of the CCD array." Pertsinidis is continuing to work with Chu and others in the group on the further development and application of this super-resolution technique. In addition to the human RNA polymerase II system, he and the group are using it to determine the structure of the Epithelial cadherin molecules that are responsible for the cell-to-cell adhesion that holds tissue and other biological materials together. Pertsinidis, Zhang, and another postdoc in Chu's research group, Sang Ryul Park, are also using this technique to create 3D measurements of the molecular organization inside brain cells. "The idea is to determine the structure and dynamics of the vesicle fusion process that releases the neurotransmitter molecules used by neurons to communicate with one another," Pertsinidis says. "Right now we are getting in situ measurements with a resolution of about 10 nanometers, but we think we can push this resolution to within two nanometers." In a collaboration with Joe Gray, Berkeley Lab's Associate Director for Life Sciences and a leading cancer researcher, postdocs in Chu's research group are also using the super-resolution technique to study the attachment of signaling molecules on the RAS protein, which has been linked to a number of cancers, including those of the breast, pancreas, lung and colon. This research could help explain why cancer therapies that perform well on some patients are ineffective on others. In addition to its biological applications, Pertsinidis, Zhang and Chu in their Nature paper say their super-resolution technique should also prove valuable to characterize and design precision photometric imaging systems in atomic physics or astronomy, and allow for new tools in optical lithography and nanometrology.